So many migrants from Veracruz have settled in North Carolina and the South that they name markets for their home state. Because of ferocious anti-immigrant laws, however, many businesses have lost customers as immigrants flee the state. Photo © David Bacon. 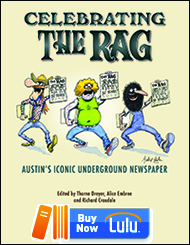 David Bacon will discuss the issues raised in this article on Rag Radio with Thorne Dreyer, on KOOP 91.7-FM in Austin on Friday, March 16, 2012, from 2-3 p.m. (CDT). The show will be streamed live here. 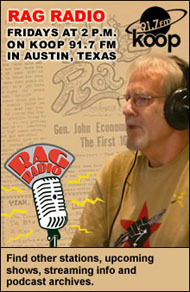 Rag Radio is rebroadcast — and streamed live — every Sunday at 10 a.m. (EDT) on WFTE-FM in Mt. Cobb and Scranton, PA. After broadcast, all shows are posted as podcasts at the Internet Archive and can be listened to here. Roberto Ortega tried to make a living slaughtering pigs in Veracruz, Mexico. “In my town, Las Choapas, after I killed a pig, I would cut it up to sell the meat,” he recalls. In 1999 he came to the United States, where he again slaughtered pigs for a living. This time, though, he did it as a worker in the world’s largest pork slaughterhouse, in Tar Heel, North Carolina. His new employer? Smithfield — the same company whose imports helped to drive small butchers like him out of business in Mexico. Ceja remembers that his family had 10 cows, as well as pigs and chickens, when he was growing up. Even then, he still had to work, and they sometimes went hungry. “But we could give milk to people who came asking for it. There were people even worse off than us,” he recalls. 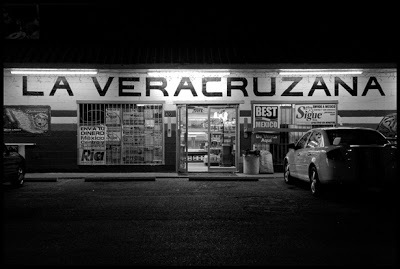 North Carolina became the number-one U.S. destination for Veracruz’s displaced farmers. Many got jobs at Smithfield, and some, like Ortega and Ceja, helped lead the 16-year fight that finally brought in a union there. But they paid a high price. Asserting their rights also made them the targets of harsh immigration enforcement and a growing wave of hostility toward Mexicans in the American South. The experience of Veracruz migrants reveals a close connection between U.S. investment and trade deals in Mexico and the displacement and migration of its people. For nearly two decades, Smithfield has used NAFTA and the forces it unleashed to become the world’s largest packer and processor of hogs and pork. But the conditions in Veracruz that helped Smithfield make high profits plunged thousands of rural residents into poverty. Tens of thousands left Mexico, many eventually helping Smithfield’s bottom line once again by working for low wages on its U.S. meatpacking lines. “The free trade agreement was the cause of our problems,” Ceja says. In 1993 Carroll Foods, a giant hog-raising corporation, partnered with a Mexican agribusiness enterprise to set up a huge pig farm known as Granjas Carroll de Mexico (GCM) in Veracruz’s Perote Valley. Smithfield, which had a longtime partnership with Carroll Foods, bought the company out in 1999. By 2008 the Perote operation was sending close to a million pigs to slaughter every year — 85 percent to Mexico City and the rest to surrounding Mexican states. Because of its location in the mountains above the city of Veracruz, Mexico’s largest port, the operation could easily receive imported corn for feed, which makes up two-thirds of the cost of raising hogs. But Smithfield didn’t just import feed into Mexico. NAFTA allowed it to import pork as well. According to Alejandro Ramírez, general director of the Confederation of Mexican Pork Producers, Mexico imported 30,000 tons of pork in 1995, the year after NAFTA took effect. By 2010 pork imports, almost all from the United States, had grown more than 25 times, to 811,000 tons. As a result, pork prices received by Mexican producers dropped 56 percent. U.S. pork exports are dominated by the largest companies. Wise estimates that Smithfield’s share of this export market is significantly greater than its 27 percent share of U.S. production. “That produces migration to the U.S. or to Mexican cities,” Ramírez charges. Corn imports also rose, from 2 million to 10.3 million tons from 1992 to 2008. 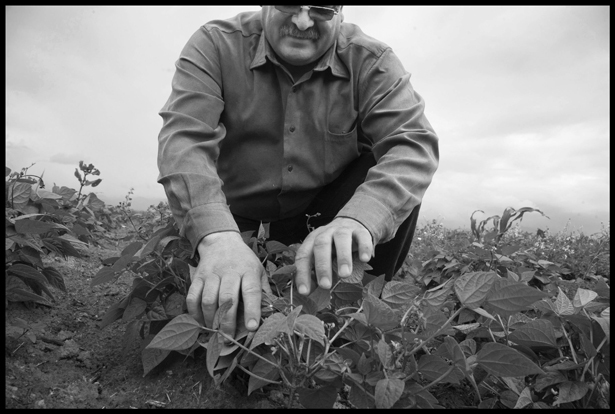 “Small Mexican farmers got hit with a double whammy,” Wise explains. “On the one hand, competitors were importing pork. 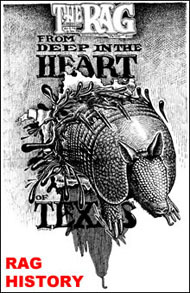 On the other, they were producing cheaper hogs.” Smithfield was both producer and importer. Wise estimates that this one company supplies 25 percent of all the pork sold in Mexico. By 2010, according to the Monterrey Institute of Technology, 53 million Mexicans were living in poverty — half the country’s population. About 20 percent live in extreme poverty, almost all in rural areas. The growth of poverty, in turn, fueled migration. In 1990, 4.5 million Mexican-born people lived in the United States. A decade later, that population had more than doubled to 9.75 million, and in 2008 it peaked at 12.67 million. About 5.7 million were able to get some kind of visa; another 7 million couldn’t but came nevertheless. As an agricultural state, Veracruz suffered from Mexico’s abandonment of two important policies, which also helped fuel migration. First, neoliberal reforms did away with Tabamex, a national marketing program for small tobacco farmers. A similar program for coffee growers ended just as world coffee prices plunged to record lows. Second, Carlos Salinas de Gortari, the country’s corrupt president, pushed through changes to Article 27 of the Constitution in 1992, dismantling land reform and allowing the sale of ejidos, or common lands, as private property. Fausto Limon looks at his bean plants, knowing they need more fertilizer, but lacking the money to buy it. Photo © David Bacon. Simultaneous changes in the United States also accelerated migration. The Immigration Reform and Control Act, passed by Congress in 1986, expanded the existing H2-A visa program, creating the current H2-A program, which allows U.S. agricultural employers to bring in workers from Mexico and other countries, giving them temporary visas tied to employment contracts. Growers in North Carolina became large users of the program, especially through the North Carolina Growers Association. Landless tobacco farmers from Veracruz became migrant tobacco workers in the Carolinas. Hog raising is a dirty business — and the environmental damage it creates has provoked rising opposition to Smithfield’s operations within U.S. borders. In Virginia in 1997, federal judge Rebecca Smith imposed the largest federal pollution fine to that date — $12.6 million — on the company for dumping pig excrement into the Pagan River, which runs into Chesapeake Bay. That year the state of North Carolina went further, passing a moratorium on the creation of any new open-air hog waste lagoons and a cap on production at its Tar Heel plant. In 2000, then-State Attorney General Mike Easley forced Smithfield to fund research by North Carolina State University to develop treatment methods for hog waste that are more effective than open lagoons. Despite North Carolina’s well-known hostility to regulating business, in 2007 Easley (by then governor) made the moratorium permanent. In the face of public outcry over stench and flies, even the anti-regulation industry association, the North Carolina Pork Council, supported it. In Mexico’s Perote Valley, however — a high, arid, volcano-rimmed basin straddling the states of Veracruz and Puebla — Smithfield could operate unburdened by the environmental restrictions that increasingly hampered its expansion in the United States. 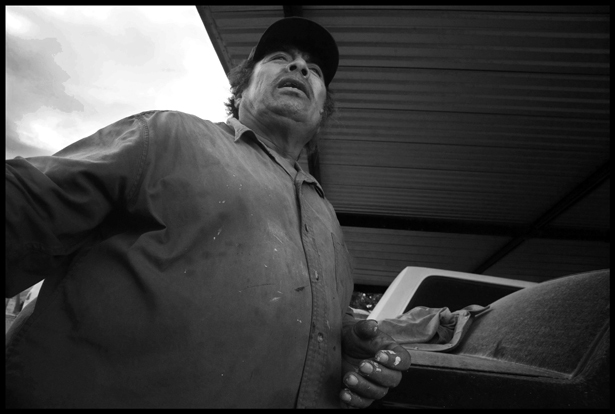 For local farmers like Fausto Limon, the hog operation was devastating. On some warm nights his children would wake up and vomit from the smell. He’d put his wife, two sons, and daughter into his beat-up pickup, and they’d drive away from his farm until they could breathe without getting sick. Then he’d park, and they’d sleep in the truck for the rest of the night. Limon and his family all had painful kidney ailments for three years. He says they kept taking medicine until finally a doctor told them to stop drinking water from the farm’s well. Last May they began hauling in bottled water. Once they stopped drinking from the well, the infections stopped. Workers aren’t employed directly by Granjas Carroll, however, according to Torres. “Since we work for a contractor, we’re not entitled to profit-sharing or company benefits,” he says. “Granjas Carroll made millions of dollars in profits, but never distributed a part of them to the workers,” as required under Mexico’s federal labor law. Torres was paid 1,250 pesos ($90) every 15 days; he says the company picked him up at 6:00 every morning and returned him home at 5:30 each evening, often six days a week. Ruben Lopez, a land commissioner in Chichicuautla, a valley town surrounded by hog farms, also says there is no membrane beneath the pools. Yet despite the 1,200 jobs the pig farms created in a valley where employment is scarce, Limon estimates that a third of the young people have left. “They don’t see a future, and every year it’s harder to live here,” he says. In 2004 a coalition of local farmers called Pueblos Unidos (United Towns) started collecting signatures for a petition to protest the expansion of the swine sheds. According to teacher Veronica Hernandez, students told her that going to school on the bus was like riding in a toilet. “Some of them fainted or got headaches,” she charges. When expansion plans moved forward nonetheless, on April 26, 2005, hundreds of people blocked the main highway. That November a construction crew about to build another shed and oxidation pond was met by 1,000 angry farmers. Police had to rescue the crew. Finally, in 2007 GCM’s Tablada Cortés signed an agreement with local towns blocking any new expansion. That year, however, the company filed criminal complaints against Hernandez and thirteen other leaders, charging them with “defaming” the company. Although the charges were eventually dropped, the farmers were intimidated and the protest movement diminished. A local farmer declares that the people of the Perote Valley want the hog farms removed to protect the environment and health of the communities there. Photo © David Bacon. Then, in early 2009, the first confirmed case of swine flu, the AH1N1 virus, was found in a five-year-old boy, Édgar Hernández from La Gloria. Pickup trucks from the local health department began spraying pesticide in the streets to kill the omnipresent flies. Nevertheless, the virus spread to Mexico City. 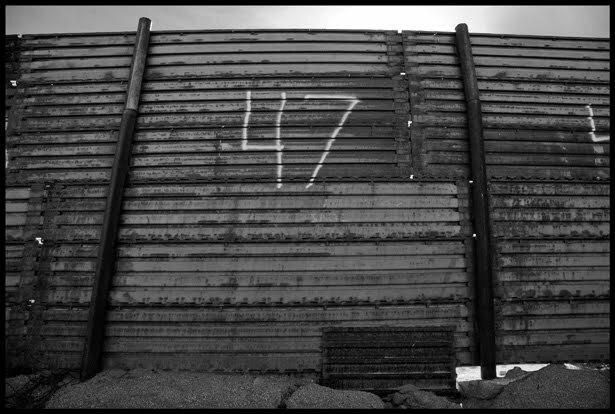 By May, 45 people in Mexico had died. Schools closed, and public events were canceled. By one estimate, fear of the virus had led to losses of $8.4 million per day for the U.S. pork industry for the first two weeks of the global scare. 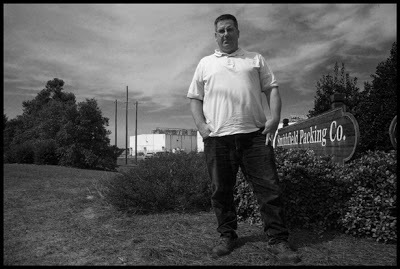 So meatpacking companies breathed a sigh of relief at Smithfield’s exoneration. In the valley, though, “no one believed it,” Limon recalls. As unrest grew in Veracruz, it was also growing among the company’s workers in North Carolina. When the Tar Heel slaughterhouse opened in 1992, its labor force was made up mostly of African-Americans and local Lumbee Native Americans. Many objected to the high line speed and the injuries that proliferated as a result. The plant kills and dismembers 32,000 hogs every day. People stand very close together as animal carcasses speed by. They wield extremely sharp knives, slicing through sinews and bone in the same motion, hundreds of times each hour. Repetitive stress and other injuries are endemic to meatpacking, and the faster the line runs, the more injuries there are. In 1997 police in riot gear lined the walkway into the plant, and workers had to file past them to cast their ballots. 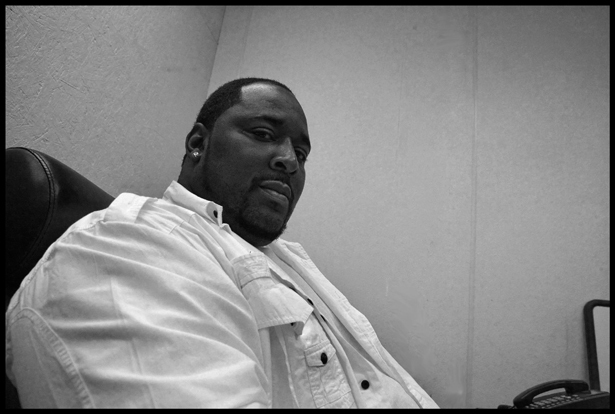 At the end of the vote count, union organizer Ray Shawn was beaten up. Security chief Danny Priest and the other guards were later deputized, and Smithfield maintained a holding cell in a trailer on the property, which workers called the company jail. Even by standards in North Carolina, where union membership and wages are low, Smithfield’s pay scale and reputation for injuries made it hard for the company to attract local workers. In the mid-’90s, Mexicans pushed by the effects of NAFTA to leave the Veracruz countryside began arriving in North Carolina and going to work at the Tar Heel slaughterhouse. All over Veracruz, meatpacking companies were recruiting them, according to Carolina Ramirez. Richards, the Smithfield spokeswoman, denied that the company recruited workers in Mexico. “With one exception [a management trainee program], Smithfield Foods does not travel to, nor advertise in, other countries or outside of our local communities to actively recruit employees for our various facilities around the country,” she said. Keith Ludlum is president of UFCW Local 1208. Photo © David Bacon. Eventually, however, like the locals, the immigrants didn’t put up with it either. In the early 2000s the UFCW sent in a new group of organizers, who began helping workers find tactics to slow down the lines. They set up a workers’ center in Red Springs, offering English classes after work. In 2003 the night cleaning crew refused to work, keeping the lines from starting the following morning. David Ceja helped organize another work stoppage a year later. Ortega was fired in 2005. “Perhaps they saw us talking about this [the union] on our meal breaks, and they started to notice there is something going on with these people,” he says. “They never told me and I never knew why I was fired. They just said, As of today there is no more work for you.” He then began making visits to other workers. By 2006 Mexicans made up about 60 percent of the plant’s 5,000 employees. In April of that year, protests and demonstrations for immigrants’ rights were spreading across the country, culminating in massive May Day rallies in dozens of cities. Hundreds left the Tar Heel plant and marched through the streets of Wilmington. On May Day only a skeleton crew showed up for work. 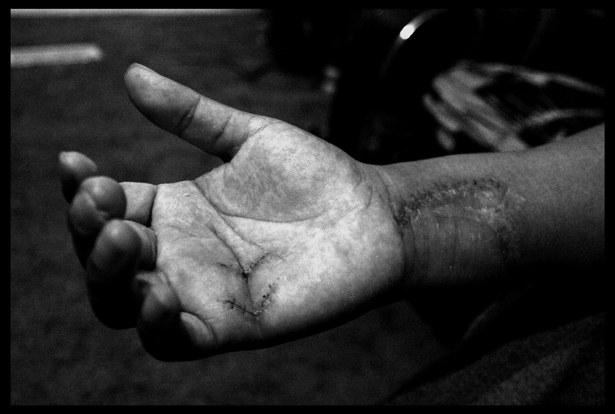 Abel Cervantes, a worker at the Smithfield pork plant in Tar Heel, was cut by a knife at work. At 20 years old, he can no longer use his hand or work. Photo © David Bacon. Ludlum, who had just been rehired after a 12-year legal battle, says, “It was really empowering to see all those workers stand up together — probably one of the best experiences of my life.” It had an effect on African-American workers too. They collected 4,000 signatures, asking the company for the day off on Martin Luther King Jr.’s birthday. When managers refused, 400 black workers on the kill line didn’t come in. With no hogs on the hooks at the beginning of the lines, no one else could work either. The plant shut down again. Nine days later, agents of Immigration and Customs Enforcement (ICE) detained 21 Smithfield workers for deportation, questioning hundreds more in the lunchroom. Fear was so intense that most immigrants didn’t show up for work the following day. A few months later, another raid took place. Some of the detained workers were later charged with federal felonies for using bad Social Security numbers. Eventually, the crackdown took its toll, and the immigrant workforce shrank by half, as people left. Union organizing stalled. But then, in 2006, led by activist Terry Slaughter, African-American workers stopped the plant again by sitting all day in the middle of the kill floor. They put union stickers on their hard hats and began collecting signatures demanding union recognition. Spurred by widespread community support and the threat of lawsuits, the company agreed to an election without its old bare-knuckle tactics. When the ballots were finally counted on December 11 that year, the union had won. Today Ludlum is president of UFCW Local 1208, and Slaughter is secretary-treasurer. Terry Slaughter is secretary-treasurer of UFCW Local 1208. Photo © David Bacon. Ludlum and Slaughter say line speed is slower now, and workers can rotate from one job to another, reducing injuries. Ceja feels that the union gave workers a tool to change conditions. “I’m glad it came in. We worked hard to get it,” he says. But he was not there to enjoy the union’s victory; he left after he was made a supervisor at the time of the raids. Smithfield didn’t invent the system of displacement and migration. It took advantage of U.S. trade and immigration policies, and of economic reforms in Mexico. In both countries, however, the company was forced to bend at least slightly in the face of popular resistance. Farmers in Perote Valley have been able to stop swine shed expansion, at least for a while. 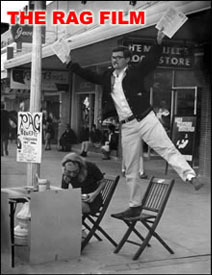 Migrant Veracruzanos helped organize a union in Tar Heel. Yet these were defensive battles against a system that needs the land and labor of workers but does its best to keep them powerless. About 11 percent of Mexico’s population lives in the United States, according to the Pew Hispanic Center. Their remittances, which were less than $4 billion in 1994 when NAFTA took effect, rose to $10 billion in 2002, and then $20 billion three years later, according to the Bank of Mexico. Even in the recession, Mexicans sent home $21.13 billion in 2010. Remittances total 3 percent of Mexico’s gross domestic product, according to Frank Holmes, investment analyst and CEO of U.S. Global Investors. They are now Mexico’s second-largest source of national income, behind oil. However, Mexico’s debt payments, mostly to U.S. banks, consume the same percentage of the GDP as remittances. Those remittances, therefore, support families and provide services that were formerly the obligation of the Mexican government. This alone gives the government a vested interest in the continuing labor flow. For Fausto Limon, the situation is stark: his family’s right to stay in Mexico, on his ranch in the Perote Valley, depends on ending the problems caused by the operation of Granjas Carroll. But he has no money for planting, and he shares the poverty created by meat and corn dumping with farmers throughout Mexico. The trade system that allows this situation to continue will inevitably produce more migrants — if not Limon, then probably his children. The fabric of sustainable rural life at his Rancho del Riego is being pulled apart. 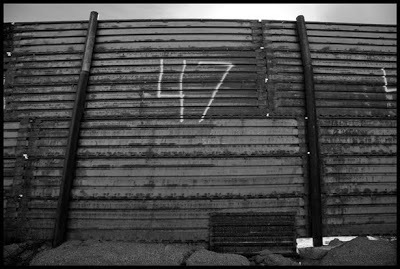 The border wall in the mountains west of Mexicali. Photo © David Bacon. In both the United States and Mexico, many migrant rights networks believe that rational immigration reform must address issues far beyond immigration law enforcement in the United States: real reform must change the U.S. trade policies that contribute to displacing people. There are some constructive proposals on the table. The TRADE Act, proposed in the 110th Congress by Maine Democratic Representative Mike Michaud, received support from many migrant rights groups because it would hold hearings to re-examine the impact of NAFTA, including provisions like the environmental side agreement that did nothing to restrict the impact of Granjas Carroll on Perote Valley. Another immigration reform proposal, called the Dignity Campaign, goes one step further. It would ban agreements that lead to displacement, like that caused by pork imports or the cross-border investments that created the Perote pig farms. It would also repeal employer sanctions, the immigration law that led to the firing of so many Veracruz migrants at the Tar Heel plant. The walkouts in Smithfield and the marches in the streets in 2006 show a deep desire among migrants for basic changes in their conditions and rights. In Perote Valley, farmers are equally determined to prevent the expansion of pig farms and the destruction of their environment. These organizing efforts are linked not just because they’re carried on by people from the same state, facing the same transnational corporation. They’re trying to change the same system. This entry was posted in Rag Bloggers and tagged David Bacon, Immigration, Labor Unions, Mexico, NAFTA. Bookmark the permalink. Worth mentioning that the illegal US government subsidy of corn, not so much NAFTA itself, is what drove the farmers out of business and led to the greatest immigration in history. As well as driving our own family farmers off their land.